Barely five months after youths opened fire at a discotheque in Sector 17, the court of Additional District and Sessions Judge Atul Kasana today acquitted all five accused in the attempt-to-murder case. A file photo of the accused in police custody. A day after the UT Administration issued an order to stop charging service charge from customers in hotels, restaurants and eating outlets in the city, the Hotel and Restaurant Association of Chandigarh, today decided that they would legally examine the orders. With the UT district courts amassing a whopping Rs 35 lakh on an average, every month towards the traffic challans’ fine, a special lok adalat on traffic will now be held every third Saturday of the month to encourage litigants and provide relief. The decision was taken today by the court authorities keeping in view the large number of traffic violators who throng the courts every day to get their challans released. A forty-five-year old man was robbed of Rs 1.10 crore by unidentified persons outside the Sector 17 bus stand after midnight. 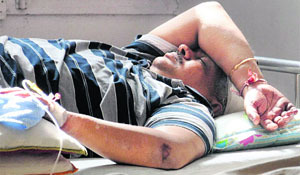 Two miscreants attacked the victim with a stick and snatched the bag containing cash from him. Seventeen-year-old Inderpreet Kaur, a resident of Muddo Sangatia village in Kurali, has made her family and the area people proud as she has made it to the U-21 Indian hockey team. Inderpreet, a class XI student of Government Model Senior Secondary School at Sector 18, Chandigarh, is extremely happy with her achievement. “It was my dream to play for India and win the World Cup. Continuing their strike, members of the Tricity Auto Rickshaw Joint Action Committee have threatened to stop CTU buses and other means of public transport at the Mani Majra light point here on Sunday. The agitators also maintained to intensify their protest if the UT administration failed to roll back its decision of banning diesel-run autos in the city. Agitating auto drivers in Panchkula today stopped a CTU bus near the underpass in Mansa Devi Complex leaving its passengers harassed. In view of the ongoing strike by diesel-run auto operators, the Chandigarh Transport Department today wrote to the neighbouring states of Haryana and Punjab to ensure safety of CTU buses in their respective areas, failing which the department would be forced to discontinue its bus service to Panchkula and Mohali. 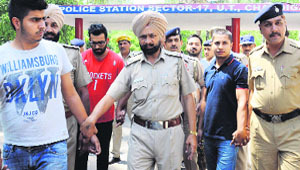 A day after a Panchkula resident was arrested for demanding extortion from local businessmen by posing as a member of a terrorist outfit, the Intelligence Bureau (IB) sleuths questioned him during the police remand. 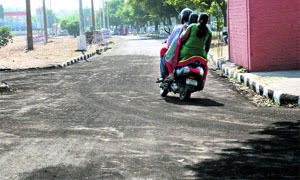 Officials of the Haryana Urban Development Authority (HUDA) seems to be in a cover-up mode as a patch on the road leading to the venue of the new Haryana CM’s oath-taking ceremony in Sector 5, which was re-carpeted on the eve of Prime Minister Narendra Modi’s visit and came off three days later, was re-carpeted again on Friday night. Bureaucrats and other officers in Panchkula took to the streets for the ‘Clean Panchkula mission’ on the directions of new Haryana Chief Minister Manohar Lal Khattar that began today. Defaulters who have not paid their property tax here for 2013-14 till now have been given relief by the government, which has cut the penalty amount from 100 per cent to 20 per cent. Army Aviation Corps, one of the youngest arms of the Army, celebrated its 28th Raising Day at Chandimandir Military Station today. To commemorate the occasion, a wreath-laying ceremony was organised where RS Yadav, Brigadier, Aviation, Western Command, paid floral tributes on behalf of all ranks of Army Aviation Corps at the Veer Smriti war memorial to pay homage to the martyrs. The 72nd Raising Day of the Intelligence Corps was celebrated with solemnity and traditional verve at the Chandimandir Military Station today. It was on this day in 1942 that the then Governor General-in-Council sanctioned the formation of the Intelligence Corps (India). The third day of the Chandigarh Literature Festival began with author and translator Arshia Sattar interacting with critic Salil Tripathi. The author is credited for her English translations of Valmiki’s Ramayana and Kathasaritsagara (Penguin). The University Institute of Pharmaceuticals Sciences (UIPS), Panjab University, which is known for its excellent research at the international level, is facing monkey menace these days. 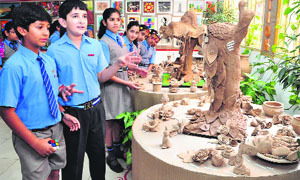 To observe the 19th founder’s week in the memory of Sardar Bhagwant Singh, students of Vivek High School, Chandigarh, exhibited artistic creativity through their work in performing arts and crafts titled “The World Within” on the school premises today. Inspired by the Swachh Bharat Abhiyan, launched by Prime Minister Narendra Modi, students, faculty and staff members of the Dr SS Bhatnagar University Institute of Chemical Engineering & Technology (SSBUICET), Panjab University, took a pledge to work towards a clean India. 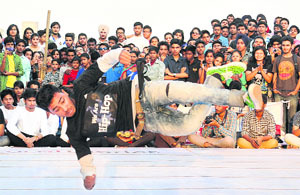 The second day of Hero PECFest 2014 commenced amid much fanfare. 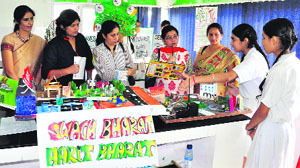 The fest attracted enthusiastic participation as over 2,000 students from the best institutes of the country descended on the PEC campus. 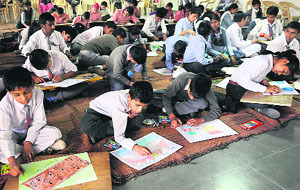 In order to prove that knowledge needs no support of language or sound, specially-abled children took part in the 6th Haryana Inter-School Quiz Competition for the Deaf. The children showcased their vast knowledge about current affairs in the competition. Nursery students of Government High School, Dadu Majra, participated in the Swachh Bharat Abhiyan under the guidance of their class teacher Jai Lakshmi. The students, along with their class teacher, cleaned the herbal garden of the school. 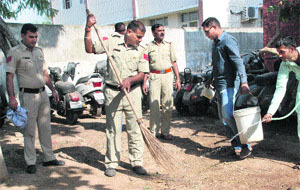 Headmistress Lovleen Kaur told the students to keep their school and home clean and green. A 21-year-old youth was stabbed to death while his companion sustained injuries when a group of armed assailants attacked them on the Lalru-Dharamgarh road near here today. The deceased is a close relative of former SGPC member Dhyan Singh Jharmari. Wanted in a murder case in Bihar, a self-syled godman who had taken refuse in a temple in Khelan village, near here, was arrested by the local police on Friday night. A car accidently caught fire here this afternoon. It was parked outside a private hospital in Dera Bassi. The cause of the fire could not be ascertained yet. In the resumed hearing of the cash-at-judge’s door case involving Justice Nirmal Yadav (retd), the prosecution examined two witnesses today. The Central Bureau of Investigation (CBI) today filed a chargesheet against a head constable of the UT traffic police in a corruption case. The Permanent Lok Adalat (Public Utility Services), Mohali, headed by Jagroop Singh Mahal, has directed the PSPCL to release a power connection to a resident of a village in Derabassi tehsil, pay Rs 5,000 as costs of litigation and Rs 25,000 as compensation. Arrested in a graft case, former SHO of the Sector 34 police station Rajesh Shukla moved an application before the court today seeking direction to defreeze a seized bank account in Dharamsala in HP, which allegedly belongs to his brother-in-law. 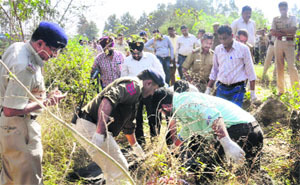 A 30-year-old man was found murdered near the railway track in Dariya village on Saturday. 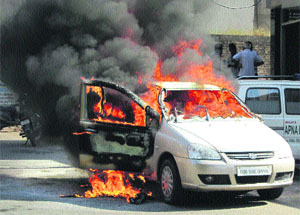 The deceased was identified as Kalu Prasad, a native of West Bengal. He was found lying in the forest area near the railway-level crossing. 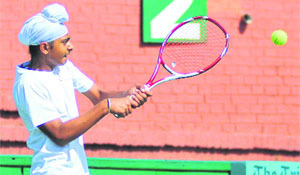 Chandigarh Academy for Rural Tennis (CHART) trainee Shashikant Rajput defeated Nishant Sindhu 9-1 with ease during the opening match of the CLTA-AITA Talent Series (TS-7) Tennis Tournament at the CLTA courts in Sector 10 here today. A fine bowling spell by the bowlers of St. Stephen’s School lead the team to destruct Carmel Convent School, Nahan, during the ICSE Inter-School Cricket Tournament, here today. St. Stephen’s School, Sector 45, registered an 8-wickets win over their rivals. After electing to bat first, Carmel side failed to face a fierce bowling attack by Sanjay and Anshul Chaudhary. The former castled 4 wickets for 13 runs while Anshul Chaudhary claimed 3 for 15 runs. For Carmel Convent, Vineet remained the highest scorer with his 30-runs contribution. Arhaan Pahwa outclassed Bhupinder Pal Singh while Ajay Singh beat Samarvir Singh with similar scores of 7-0, in straight sets, during the ongoing Ideal Tennis Academy (ITA)-AITA Talent Series Tournament, held at Manav Mangal School, here today. Both the players registered wins in the boys’ (U-12) first round matches. In the second round matches, Gaurav Kumar had an easy run over Sidharth Bhalla at 7-0 while his counterpart Sidharth Basaiti defeated Ronav Caundh at 7-0. Punjab bowled out Jammu and Kashmir Cricket Association on 195 runs during the first day’s play for the (U-19) Cooch Behar trophy at Dhruv Pandove Stadium in Patiala today. 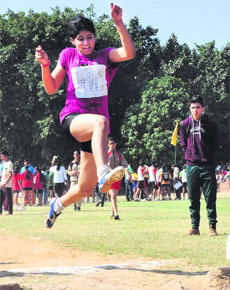 Athletes of Bhavan Vidyalaya, Panchkula, claimed gold medal in the (U-19) girls 4x100m relay event during the CBSE Cluster-XIII Athletics Meet at PML SD Public School in Sector 32 here today.